Bordered by the Coast Mountain Range and the Pacific Ocean, Vancouver is not only recognizable as one of the world’s most scenic cities but is renowned for its innovative programs in the area of sustainability. 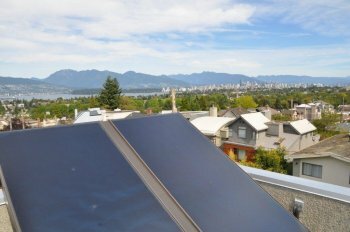 Vancouver has taken great leadership in the development of solar demonstration projects as well as mandating that all new homes be built solar ready. As well, a $4300 subsidy is now being provided to the first 30 eligible homeowners in both new and existing homes. Only homes using natural gas heated hot water are eligible and systems installed under this incentive program must meet the City of Vancouver’s requirements, including a double-walled heat exchanger with leak detection (currently only Enerworks systems). This program, in partnership with SolarBC, Terasen and Offsetters, follows on the heels of Vancouver’s 2008 Green Homes Program which requires all new houses to be ‘solar ready’. Vancouver currently has the greenest building code for new houses in North America with a continued commitment to achieving LEED (Leadership in Energy and Environmental Design) Gold for new municipal facilities. The development and installation of on-site renewable energy is critical towards achieving Vancouver’s future target of carbon neutral new construction.